This goes down as one of my favorite videos from a CASHUNT! Watch the whole video it's pretty funny. 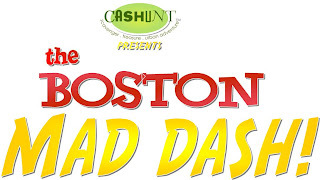 Cashunt as always provides monthly Public Mad Dashes in Boston for the Spring and Summer Months, and this year is no different. Below is general information in regards to the Dash and how to get your team together! and a boston theme hunt. We will provide the cameras , host, game, and prizes each team will receive their photos and videos on their own customized cd. That will be sent to them in one week. one per team. All games are on Saturdays or Sundays and start at 2pm and end at 4:30 at Fanuiel Hall in Boston. We are only excepting 4 teams for this event. For more information on this game please email us with your contact info. at cashunt@gmail.com and game coordinator will call you back with all the information. for more info on our other games log onto www.cashunt.com .